As the manager of Google’s People Innovation Lab (PiLab) team, which researches making work better in and outside of Google. I regularly find myself performing what’s called “Distributed Work” collaborating with teammates who aren’t based in San Francisco with me. It’s not unusual in a single day to be emailing with Googlers in Tokyo or Boulder for a quick chat or setting up weekly meetings via video chat with people in our New York offices. Coordinating these meetings can be difficult. Teammates in Asia often have to get up earlier than usual to join video chats and we try not to ask our East Coast colleagues to stay too far into their evening for meetings with the teams in Mountain View, California. Get to know each other as people:Instead of jumping right into an agenda, allow some time at the top of the meeting for an open-ended question, like “what did you do this weekend?” It’s an easy way to build remote connections and establish a rapport. We found managers leading by example and making an extra effort to get to know distributed team members can be extra impactful. Forge in-person and virtual connections: Sometimes it’s just easier to be face to face. Managers should provide clear guidelines and opportunities for team members to travel for in person meetings. On a video call, express reactions to coworkers ideas noticeably to indicate they’re being heard. When you do have the opportunity to meet for face to face interactions – take advantage in order to reinforce connections forged virtually. As a manager of a distributed team, I’ve started to put these tips into action myself. I host virtual weekly lunches to create space for casual conversations between teammates and send weekly “Pi” (from PiLab) emails to share goals for the week, potential barriers to getting work done, wins or accomplishments, and an emoji to make it fun and personal. 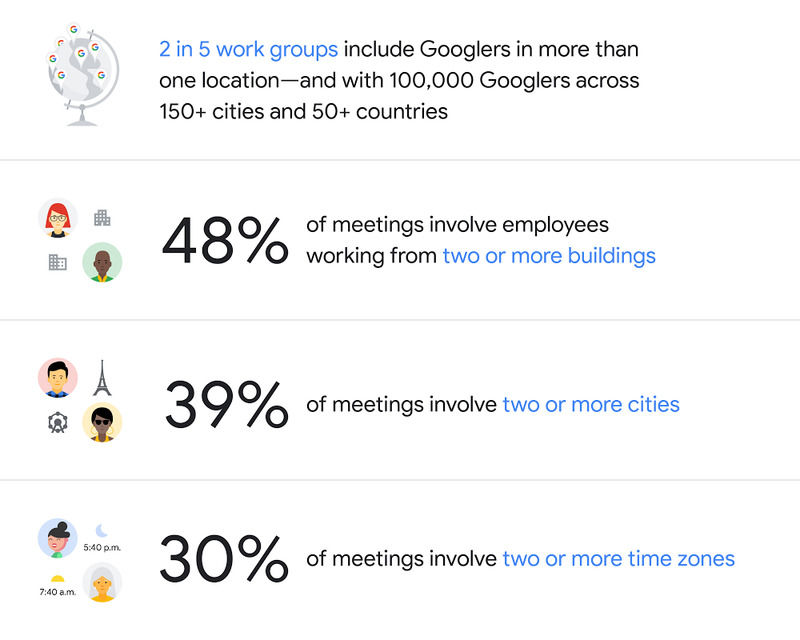 At Google, we’re always looking to improve our practices to help Googlers do their best work, and hope this research will make it easier for teams to effectively and happily work together, no matter where they are based.